In honour of Father’s day, I’m sharing this delicious recipe from my father (he made these for me last weekend). This is a delicious, decadent and easy breakfast to make your weekend (or weekeday) breakfast feel special. You can top with a hollandaise sauce, sprinkle with paprika or top with your favourite accompaniment for eggs. Preheat oven 425F. Place separated patty shells on a baking tray. Bake on middle of the oven rack for 18-20 mins or until done. With a fork, remove the cut-out tops. Meanwhile, fill a large skillet with water until about 2 inches deep. Add the vinegar and bring water to a low simmer over medium-high heat. Place a slotted spoon in a small square tupperware. Ensure the tupperware is near the skillet for a quick transfer of the egg. Crack the first egg over the spoon. Working quickly, lift the spoon and gently place egg into the simmering water. Repeat with remaining eggs. This technique will remove any loose egg whites and prevent the egg from running everywhere in the water. Gently keep the eggs moving around the skillet with a slotted spoon for about 4-6 mins or until desired doneness. Remove eggs from the water and place each egg in a vol-au-vent. 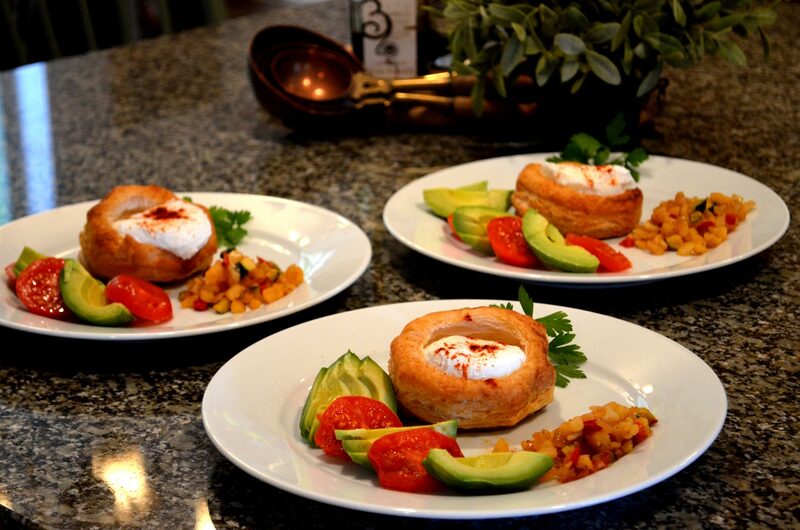 Place a tbs of bacon bits and one cooked egg into each vol-au-vent and top with a sprinkle of paprika.